1 mile (total) Falls & Pigeon River Cascades. The waterfall is not tall, but the cascades are beautiful. You can venture out above and below the bridge. To get the photo left, take one of the steep trails across the road from the parking area. Then cross the stream on the rocks.. Above the bridge, have lunch on the boulders by the cascades or climb up the left edge to the upper falls and pool! Careful on the rocks when wet. Bring a book, you won’t want to leave! You can imagine the work it took years ago to build this bridge – spectacular construction for almost 80 years ago! Take the Blue Ridge parkway to milepost 423 exit on NC Highway 215. 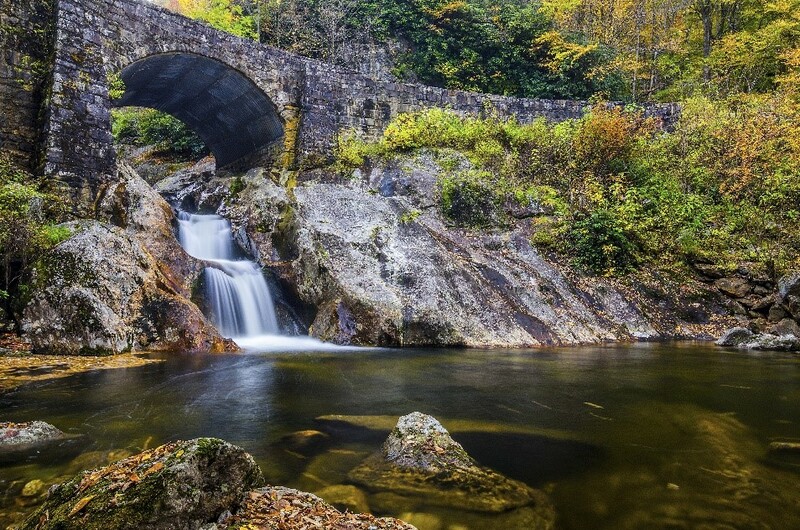 Head north on the Forest Heritage Scenic Byway (NC215) for 4.2 miles, you’ll cross a bridge with a stream passing at 2 mi., a parking area to the right is a great hike with camping for another day, continue to the historic arched stone bridge built in 1937 pictured. Cross the bridge pull-off for parking on your left. A series of cascades, including a waterfall beneath. This is the West Fork of the Pigeon River, located in the Pisgah National Forest. Many call it Sunburst Falls, since it’s near the Sunburst community.